Most people think of the American Revolution as an isolated war between Great Britain and her rebellious colonies. The Revolution was, in fact, part of a worldwide struggle which encompassed many armies and many countries. The French were involved in India, Africa, the Caribbean, Gibraltar and America. Several French regiments were formed specifically for service overseas. Lauzun's Legion was such a regiment. Armand-Louis de Gontaut, the Duc de Lauzun, was born on April 13, 1747 into a family that had been titled since the 12th century. He was born at a family chateau just north of Paris. His father, Charles-Antoine-Armand de Gontaut, lived until 1796. His mother, Antoinette-Eustachie Crozat de Chatel, died giving him birth. At the age of 14 he entered the Gardes Francaises, an elite Guard regiment commanded by his uncle, the Duc de Biron, as enseigne a drapeau. At the age of 19 he was unwillingly married to Amelie de Boufflers, granddaughter of the Princess de Luxembourg. For the whole time of their marriage they lived apart and had no children. In 1767 he was breveted a colonel at the age of 20 and later served as aide-de-camp to the Marquis de Chauvelin during the expedition to Corsica in 1769. Because of various military duties in the Department of War, Lauzun traveled extensively throughout England and Europe during the early 1770's. He visited Frederick the Great in 1774 and presented a paper to the French War Ministry detailing Prussian military training, organization and recruitment. In 1776 he was offered the command of a new corps of foreign hussars being formed in Russia by Catherine the Great but Louis XVI would not grant him permission to serve in a foreign army. He also wrote a pamphlet outlining an invasion of England via the Channel Islands. Although rumored to be a ladies man, court life did not suit him. He was anxious for more military duties and found the cost of remaining at court absurd. He appealed vigorously to Louis XVI who finally authorized the formation of a corps in 1778 to be commanded by Lauzun. On September 1, 1778 an edict created the Volontaires Étrangers de la Marine (Foreign Volunteers of the Navy). Having served all this time in the Department of the Army, Lauzun now moved into the Department of the Marine since this new corps was formed for colonial service and the Navy was responsible for colonial operations. This new corps was to be composed of 8 Legions and a Compagnie Generale (Headquarters Company). Each Legion would be composed of 8 companies: one Grenadier, one Chasseur, two Fusilier, one Artillery, two Hussar and one Artificier company. After much recruiting effort, only 3 of the 8 Legions were formed; these being the First, Second and Third. Grenadiers were elite soldiers originally used in the 17th century for throwing grenades and storming fortifications; however, sometime in the 18th century, Grenadiers were no longer intended for throwing grenades but solely an elite company which acted like standard infantry but harder hitting. In theory, these men were taller. Chasseurs, the French word for hunter, were light infantry, used for skirmishing and scouting; they moved faster than other infantry and were also elite. In theory, Chasseurs were smaller and lighter than Grenadiers and Fusiliers. The standard infantryman was the Fusilier. Artillery, of course, used cannons and mortars - French artillery was considered the finest in Europe. Hussars were light cavalry based on the original Hungarian cavalry of the same name; eventually all of Europe had hussars in their armies. In comparison, heavy cavalry, like modern armor today, was used for smashing through the enemy lines. Light cavalry was used for quick maneuvering on the field and hit and run actions. Artificiers were the craftsmen of the military and did any repairs as needed; our theory is that Lauzun’s had an Artificier Company because the Legion was intended to be self-sufficient. The Grenadier, Chasseur and Fusilier uniform would consist of a celeste-blue (sky blue) wool coat with citron (lemon) yellow wool facings (lapels and cuffs), lined in grey toile with no turnback designations and white metal (pewter) buttons stamped with an anchor. The First Legion's epaulets and standing collar would be yellow, Second Legion's white and Third Legion's red. The sleeved waistcoat would be white cotton duck or canvas lined in grey toile with an open armpit for ease in movement and white metal buttons. The breeches would be of the same material as the waistcoat except the buttons would be cloth-covered in the same material. A black cloth neckstock allowing only a small amount of collar showing; one pair of white gaiters with 25 white cloth-covered buttons per gaiter and another pair of blackened gaiters with 25 black buttons each. A recipe for blackening gaiters is in the 1775 regulations and translated makes a dye not a paint; the old white pair was used for this blackened pair. A black cocked hat in the French style, meaning a bicorne, with white tape and black cockade for the Chasseurs, Fusiliers and Canonniers. The Grenadiers wore a bearskin without a front plate. All under-officers, Grenadiers, Chasseurs and Canonniers carried infantry sabers with black leather sword knots to be hung on a white leather waistbelt with brass plate and a frog for the bayonet; a cartridge box without front plate on a white shoulder belt. They were armed with the Charleville musket and bayonet The Artillery company may have worn the dark blue coat of the regular French artillery but with lemon yellow facings rather than red. The Artificer company may have worn the same uniform as the Grenadiers, Chasseurs and Fusiliers. The Compagnie Generale would wear a dolman in sky blue wool, lined in grey toile and edged in scarlet wool, braid in yellow worsted, round brass buttons, pockets bordered in scarlet wool and red cuffs; a sky blue wool pelisse ala Hongroise, lined in grey toile, yellow braid and pockets bordered in yellow, round brass buttons, yellow cuffs and edged in yellow fur and breeches in scarlet wool lined with toile; an eight-foot long sash of scarlet wool braid with knots of yellow wool; a sabertache of leather covered in sky blue wool, edged in scarlet worsted, with the royal cipher and an anchor of yellow wool attached to a scarlet background sewn to the center of the front flap; a cloak of grey wool with scarlet facings and a shako of black felt with scarlet trim. The Legion hussars wore a similar dolman except edged in yellow wool, white worsted braid, pockets bordered in yellow wool, yellow cuffs and round pewter buttons; the pelisse had white braid, pockets bordered in white, yellow cuffs, pewter buttons and edged in red fur and breeches in yellow wool lined in toile; an eight-foot long sash of yellow wool braid with knots of scarlet wool; a sky blue wool sabertache, edged in white worsted, with the royal cipher and an anchor of white wool attached to a yellow background and sewn to the center of the front flap; cloak of grey wool with yellow facings and shako of black felt with yellow trim. All hussars wore black Hungarian-styled boots, carried Hungarian-styled sabers, black calfskin cartridge boxes, belts of Russian (red) leather; a porte-manteau in royal blue wool edged in royal livery and a black neckstock. Besides the saber, each hussar carried a fusil and pistols. By October 28th part of this new Legion, commanded by Lauzun , was on it's way to Senegal to recapture France's slaving stations from the British. By January 30, 1779 they reached Fort St. Louis. The British surrendered almost immediately. 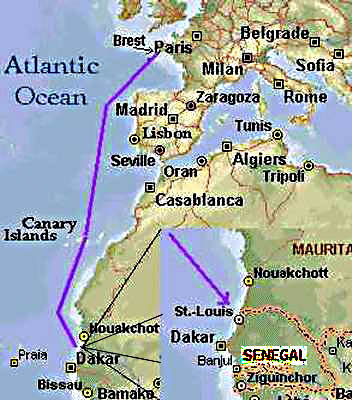 Lauzun left a small garrison and returned to France after signing treaties with the local African kings and princes. Upon return to France neither Lauzun nor his men were promoted or rewarded for this accomplishment. On June 25, 1779 an edict amalgamated Lauzun's corps with that of the Volontaires Étrangers de Nassau. Lauzun had been promised that his corps would remain together and under his command. This was just another promise not kept by the court which would result in his political alliance in the years to come. In the meantime, however, documents show that part of the Volontaires Étrangers de la Marine were with d'Estaing at Savannah in September 1779. This was probably the First Legion which had been sent to the West Indies and had already taken part in the capture of Grenada in July 1779. Lauzun was made Proprietary Colonel Inspector of a new Legion to be composed of 600 cavalry and 1,800 infantry to be attached to the Hungarian cavalry. However, at about this time, France and Spain were preparing for an invasion of England and Lauzun wanted to be part of it. He asked for and received a command under de Vaux but, by November 1779, the invasion came to nothing due to weather complications and the late arrival of the Spanish even though the English were drastically short of men and ships due to the war in America and were scrambling to mount coastal defenses. Lauzun returned to Paris then later to his Legion where he found it to consist of only 800 infantry and 400 cavalry due to broken promises again. His new Legion, composed of the 2nd Legion of the old Volontaires Étrangers de la Marine and new recruits, was named Volontaires Étrangers de Lauzun (Foreign Volunteers of Lauzun). This new Legion was composed of 5 companies of infantry which was made up of 2 companies of Fusiliers, one Grenadier, one Artillery and one Chasseur company; and two troops of hussars, each composed of one company - one of French hussars and the other of Polish lancers. The uniform of this new Legion would be the same as previously described for the Volontaires Étrangers de la Marine with a few exceptions outlined in its Ordonnance including a stipulation that all hussars would be dressed as previously regulated for the Compagnie Generale. In December 1779 the decision to send troops to America under the command of the Comte de Rochambeau was made and it became known as Expedition Particuliere. Lauzun asked that he and his Legion be part of this army which was agreed to by Rochambeau. On March 5, 1780 the Legion was finally made official by a royal ordonnance. On April 12, 1780 the troops embarked at Brest but, as a result of bad weather, the convoy did not sail until May 2. Due to a shortage of transports, several regiments, all of the horses and approximately one-third of the Legion (the Fusilier companies) were left behind. Lauzun sailed to America with his depleted Legion, which now consisted of 600 infantry (chasseurs, grenadiers, artillery and possibly a corps of artificiers) and 200 hussars. The fleet arrived on July 11th off the coast of Newport, RI and, upon arrival, had to purchase horses for the hussars and officers. Due to lack of fodder, the hussars were sent to Lebanon, CT, which Lauzun later compared to Siberia, while the infantry companies would remain in Newport until early the following year. In addition to the infantry, approximately 50 hussars remained at Newport as couriers for Rochambeau. During the remainder of 1780 and into 1781 the Legion was used as guards for protecting the wagons coming from various ports bringing supplies and money to Rochambeau. In November 1780, General Nathanael Greene asked Washington to speak with Rochambeau about detaching the Legion and sending them south to join his army. Needless to say, the request was denied by Washington since he wanted the Legion where it was for now. In February 1781, Lauzun, bored from inactivity, sent Alexander Hamilton a letter to forward to Lafayette which asked if he (Lauzun) would be permitted to show what he and his Legion could do if it were possible to be detached and join him since he (Lafayette) was seeing action. Since the Legion had a good portion of Germans, the ability to attract deserters from the Hessian regiments was great. A notice designed to entice desertion in the Hessian regiments is from the Simcoe Papers. It encourages German deserters from the armies of Great Britain to enlist with either Lauzun's Legion or the Royal Deux Ponts. It further states that those who do desert to these regiments will be paid, fed and clothed well. Due to these desertions, the Legion gained several men. In June 1781 Washington informed Rochambeau that he wanted to attempt an attack on New York. Both Rochambeau and deGrasse outline the enormous problems with this idea....one of these was Sandy Hook which, in deGrasse's opinion, was too shallow for his ships to pass over. Eventually they convince Washington to look elsewhere for a joint action. During the march from June to July 1781 when the French Army joined up with the Continental Army, Lauzun’s Legion paralleled the 4 French divisions as guard on their left flank. On the march, the Legion included the French Army’s field artillery, war commissaries and the baggage train. One eyewitness account of the Legion’s passing mentions 810 wagons, each pulled by 2 yoke of oxen and a lead horse! Later in July, Lauzun and his Legion are ordered to reconnoiter the outlying areas of New York. On July 21, accompanied by Americans under the command of General Lincoln, Lauzun is ordered to take Fort Knyphausen, near Morrisiana-Kingsbridge (now the Bronx). This action is described by Lauzun: "I should have to march all night, to attack them before daybreak; he (Washington) added to my regiment one of American dragoons (2nd Continental Dragoons), some companies of light horse, and some battalions of American light infantry. He had dispatched by another road, about 6 miles to our right, General Lincoln, with a corps of 3,000 men, to surprise Fort Kniphausen, from which I was to cut off all support. He was not to show himself until my attack was under way....He amused himself by firing at a little post which had not seen him, and roused the whole of the corps that I was to surprise. It retired into the fort, made a sortie against General Lincoln, who was beaten, and would have been cut off from the rest of the army, had I not come promptly to his rescue. Although my troops were thoroughly worn out, I advanced upon the English; I charged their cavalry, and my infantry exchanged fire with theirs. General Lincoln took the opportunity to beat a retreat in considerable disorder." After this action, Lauzun's Legion went into camp at Phillipsburg, NY, with the rest of the French army. The French army, shortly thereafter, began the long march towards Yorktown. It marched in divisions, each sleeping in the tents the previous division had the night before. The Legion took the left flank of the army again, covering it from possible attack. When they arrived at the Head of Elk, Lauzun and his infantry embarked "on all manner of craft.” Lauzun had insisted upon accompanying his infantry since he felt they would enter the firing-line before the others. The voyage to the James River was not uneventful. According to Lauzun: "on the third day of our voyage we had a very bad time. The boats were vile; two or three of them foundered, and we had seven or eight men drowned." The boats then anchored off Annapolis and waited for further orders. After 3 days, orders arrived to re-embark. Due to adverse winds, it took 10 days to reach the mouth of the James River during which time their biscuits and cheese ran out. To compensate for the lack of food, the boats stopped whenever possible and the soldiers were allowed to scavenge. At Hampton, they returned with a pig and some chickens which they obtained, not with money, but “with musket shot! Upon arriving, Lauzun was ordered to go to Gloucester to prevent Cornwallis from using it as a possible escape route. The American General Weedon was in command, being senior to Lauzun, but Washington wrote to Weedon informing him not to interfere with Lauzun's orders in regards to his Legion. When Lauzun arrived at Gloucester he wrote "I went with my regiment to join General Weedon's corps. His method of blockading Gloucester was original; he was more than 15 miles from the enemy's outposts, was frightened to death, and dared not send out a patrol as much as half a mile from his camp....I made M. de Rochambeau a report...;I told him that we could not rely upon the American militia, and that it was essential that he send me at least 2 additional battalions of French infantry. I had no artillery, no rations, no powder....he at once sent artillery and 800 men drawn from the garrisons of the ships under M. de Choisy, who, by right of seniority, took command over General Weedon and myself." Lauzun's was augmented by the addition of sailors and soldiers off of the French ships outside of the bay. One of the regiments sent to Lauzun was the Barrois Regiment, which wore white coats faced green. Also brought up from the West Indies with DeGrasse was a contingent of hussars, probably from the First Legion, who joined the Legion at Gloucester. A corporal's guard from the Dillon Regiment, who wore red coats faced yellow (designating them as an Irish regiment), had accompanied the Legion from the beginning of the American campaign. On October 4th, the confrontation between Lauzun's and Tarleton's Legion took place. In Lauzun's words: "Just as we were entering the plain of Gloucester, some dragoons of the State of Virginia came in a great panic to tell us that they had seen some English dragoons in the open, and, for fear of accidents, had ridden away hell for leather, without examining them further. I rode forward to try to find out more about them. I caught sight of a fine-looking woman at the door of a little house, upon the high road; I went to question her; she told me that, at that very moment, Colonel Tarleton had left her house; that she did not know whether many troops had come out of Gloucester; that Colonel Tarleton was most anxious 'to shake hands with the French duke.' I assured her that I had come there on purpose to give him that satisfaction. She condoled with me, thinking, I suppose, from experience, that it was impossible to resist Tarleton: the American troops were in a similar case. I had not gone a hundred yards from the house, when I heard my advance guard firing their pistols. I advanced at a gallop to find a terrain upon which I could open battle. I saw as I approached that the English cavalry outnumbered mine by three to one; I charged them without drawing rein; our lines met. Tarleton caught sight of me, and came towards me with raised pistol. We were about to fight a duel between our lines, when his horse was overthrown by one of his dragoons pursued by one of my lancers. I dashed upon him, to take him prisoner; a troop of English dragoons thrust themselves between us, and covered his retreat: his horse remained in my hands. He charged me a second time without breaking my line; I charged him a third time, routed part of his cavalry, and pursued him as far as the earthworks of Gloucester." Tarleton describes the action in his memoirs, in third person: "Part of the Legion, of the 17th, and of Simcoe's dragoons, were ordered to face about in the wood, whilst Lieutenant-Colonel Tarleton, with Lieutenant Cameron's party, reconnoitered the enemy....when a dragoon's horse of the British Legion, plunged, on being struck with a spear by one of the hulans, and overthrew Lieutenant-Colonel Tarleton and his horse. This circumstance happening so much nearer to the body of the French than the British cavalry, excited an apprehension in the latter for the safety of their commanding officer. Impelled by this idea, the whole of the English rear guard set out full speed from its distant situation, and arrived in such disorder, that its charge was unable to make an impression upon the Duke of Lauzun's hussars....Meanwhile, Tarleton escaped the enemy, and obtained another horse. A disposition was instantly made to charge the front of the hussars....whilst a detachment wheeled upon their flank: No shock, however, took place between the two bodies of cavalry; the French hussars retired behind their infantry....Many attempts were made afterwards to detach the French hussars from their infantry, but they were all ineffectual." Another interesting action to come from this encounter is recorded by Baron Cromot du Bourg, an aide to Rochambeau: "The Duke de Lauzun, after charging several times at the head of his Legion, was ordered by M. de Choisey to fall back and obeyed. As he was returning with his troops he saw one of the lancers of his Legion at some distance engaged with two of Tarleton's dragoons. Without a word to any one, he lowered his guard and went to his assistance. I only knew of this incident on the 20th November from M. de Rochambeau; the modesty of M. de Lauzun had prevented his mentioning it, but I should feel that I was very wrong should I omit to write down in this Journal everything that relates to the Duke de Lauzun, who, in these minor actions, set the best possible example to the army. There is no mention in any records of Lauzun having been present at the surrender ceremony at Yorktown on October 19, 1781. It would seem more logical, however, that he would have been present at the smaller ceremony at Gloucester which took place on the same day at 1 PM. Several days later, Lauzun was on his way to France to inform the King of the victory at Yorktown. He arrived in France at the height of the celebrations surrounding the birth of the King's son which resulted in him having to wait several days before seeing the king. He had fallen from favor at court due to rivalries and, to make matters worse, the representative he had appointed to care for his estate in his absence had bankrupted him. Later, while waiting in port for the return to America, he had to ask a friend for a temporary loan to cover expenses. Besides these embarrassments, Lauzun returned to America without promotions or rewards for any officer or soldier having served under Rochambeau. Lauzun arrived back in America in September 1782 to take command of the French Army from Rochambeau who had already returned to France. The Legion had gone into quarters immediately after Yorktown at Hampton, VA and various other areas during the early part of 1783. In April 1783 he received orders for the army to return to France and, upon arrival, in June 1783 his infantry was disbanded by the court contrary to promises made earlier. His hussar troops were renamed Lauzun's Hussars. With the revolution in France coming, the court having broken all promises to him and others, he joined the Orleanist Party. He served in various military offices, was promoted to General, given command of the Army of the North and later commanded the army which defeated the Vendeans. Lauzun began to suffer from various illnesses, probably ulcers since he complained of stomach pains, spitting up blood and bloating. For various reasons, which are too numerous and petty to relate, he was summoned to Paris in 1793. He was soon found guilty of being too lenient to prisoners and sentenced to death. He was guillotined on December 31, 1793 at the age of 46. Lauzun's Hussars outlived their famous commander: in 1791 they became the 6th Hussars; in 1793 redesignated the 5th Hussars when the 4th Hussars deserted to the Royalist side. Other than Lauzun, their most famous commander was the future Marshal of France under Napoleon, Emmanuel de Grouchy. The Legion may yet exist in a current French armored unit....further research will tell. As part of a world struggle, the American Revolution created the foundation for a friendship between France and America that would last into this century. Many Frenchmen and others lost their lives here fighting for American independence just as Americans would lose their lives 160 years later for France.